"The Good Wife" kicks back into high gear this Sunday, and we'll be jumping in to the results of four different cliffhangers from Season 3. Don't remember all the nuts and bolts of the spring finale? You can head over to Yahoo! TV and read my recap, where you'll also get a peek into how Season 4 will be handling some of the big issues. So what other SPOILERS do we have for Season 4? Well, for one thing, Kristin Chenoweth will not only appear in the Season 4 premiere, but will have a continuing arc on the series. It had previously been thought that her storyline as a journalist might be cut short due to an on-set injury, but thankfully she's reportedly back to filming scenes on "The Good Wife." For more good news on "The Good Wife," the talented Maura Tierney will guest star on the show as a wealthy businesswoman who could become the Big Money behind Peter's campaign for governor. Tierney lost a lead role in "Parenthood" due to a battle with cancer, but she continued on with "Rescue Me" and it'll be great to see her here. 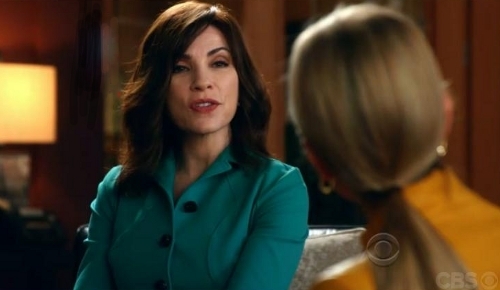 One of the things I love most about "The Good Wife" is all the opportunities for good characters it provides for actresses we admire. One of the spoilers I'm less happy about is that apparently Alicia will have to defend her son in court after "a run-in with a state trooper." I'm hoping that Zach is not at fault in this instance, because I've never been a fan of his punky, rebellious teenager regressions. In other casting news, John Shea ("Gossip Girl") will be coming on the show as Cary's dad, a guy who kicked his son out of the house at 18 so he could learn to fend for himself. It will be interesting to see how impressed he is with what Cary has been up to--we're guessing it's not going to be a perfect relationship. Don't forget to check out "The Good Wife": Where we left off, and what's in store for Season 4 before you watch the Season 4 premire on Sunday, September 30 at 9/8c.